Sound the Trumpet, Beat the Drums: Horse-Mounted Bands of the U.S. Army, 1820–1940. Stemming from the tradition of rallying troops and frightening enemies, mounted bands played a unique and distinctive role in American military history. Their fascinating story within the U.S. Army unfolds in this latest book from noted music historian and former army musician Bruce P. Gleason. Sound the Trumpet, Beat the Drums follows American horse-mounted bands from the nation's military infancy through its emergence as a world power during World War II and the corresponding shift from horse-powered to mechanized cavalry. Gleason traces these bands to their origins, including the horn-blowing Celtic and Roman cavalries of antiquity and the mounted Middle Eastern musicians whom European Crusaders encountered in the Holy Land. He describes the performance, musical selections, composition, and duties of American mounted bands that have served regular, militia, volunteer, and National Guard regiments in military and civil parades and concerts, in ceremonies, and on the battlefield. Over time the composition of the bands has changed—beginning with trumpets and drums and expanding to full-fledged concert bands on horseback. Woven throughout the book are often-surprising strands of American military history from the War of 1812 through the Civil War, action on the western frontier, and the two world wars. 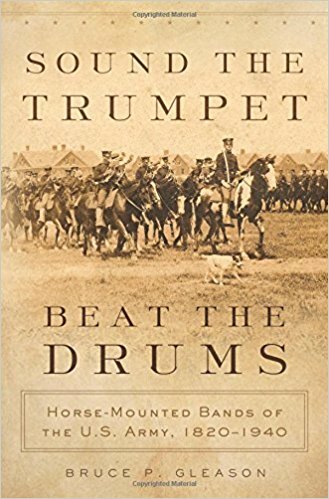 Touching on anthropology, musicology, and the history of the United States and its military, Sound the Trumpet, Beat the Drums is an unparalleled account of mounted military bands and their cultural significance.